From the shores of Lake Chelan to the Pacific coastline at Copalis, from the Cascade forests of Carson to the crisp elevations near Conconully and the Canadian border, Western Washington has thousands of miles of scenic and enjoyable dual sport riding. Until now most riders have learned rides from each other. Finally there’s a guidebook that spells it all out with proven routes on maintained paved and gravel roads. The 28 rides that lie within these pages are sure to take you places you’ve never been before. Divided into the various regions around Western Washington, this guide book is designed to provide you with several rides each day. All the rides here can be done in four hours or less and are nearby other rides. Have breakfast, go for a ride, have lunch, take another ride and by day’s end you’ll have an ear-to-ear grin. Each ride includes mileage, saddle time, skill ratings, highlights, turn-by-turn directions and a map. Optional GPS routes are available. An avid dual sport enthusiast himself, author Tom Mehren has spent more than seven years riding the routes and working on content for this book. He is the publisher of the Northwest magazine, Sound RIDER! and founded the Dualsport Northwest Rally in 2005. Dual sport riding is an experience you can’t get riding on pavement alone. It challenges the rider’s skills, it’s an excellent form of exercise and comes with the payoff of stunning scenery with sweeping vista points that can’t be had otherwise. There’s no better or more complete way to experience all that Western Washington has to offer than from the pegs of a dualsport motorcycle. This is what adventure riding is all about! All routes have been written to Garmin MapSource GPS format and open GPX format using hard waypoints, not unreliable via points. Choose the option for the GPS routes and we'll send you a nifty CD ROM to make it easy to navigate all the routes. We've even tossed in a few bonus routes to sweeten the deal. Don't have a Garmin GPS? You can convert the routes to other formats at GPSbabel.org. 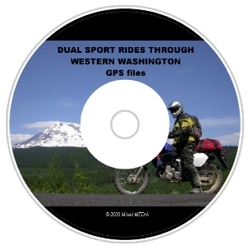 GPS Files are only available for purchase online.